So, it's official. I now have my first brother! This weekend, my oldest sister April married her fiance Ian. The beautiful ceremony and reception were held at 701 Whaley in downtown Columbia. The day before they wed, last Friday, my mom hosted a bridal shower at Occo Skin Studio. This is where I surprised April with the fabulous vintage cake plates I bought from Knack. We planned on having a little lunch in their outside courtyard area, and when April arrived this is what she saw. 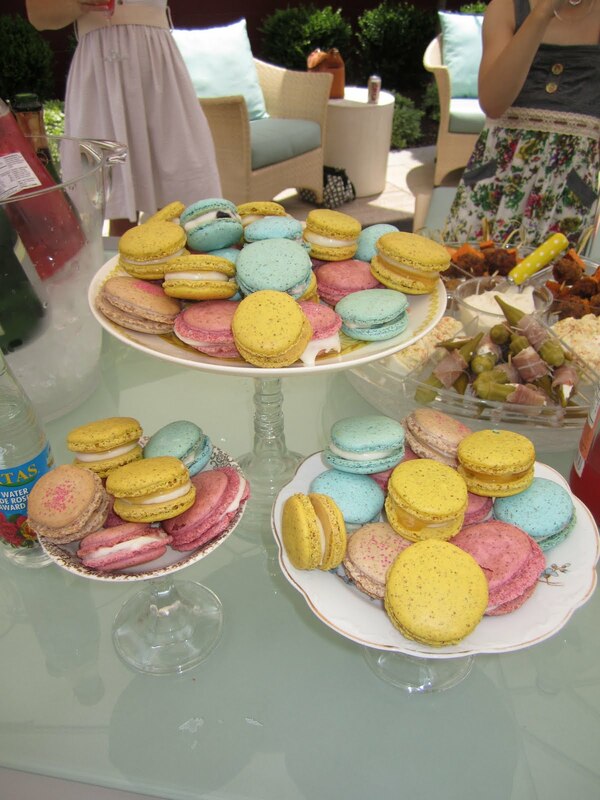 I made these macarons for our sweet treat at the bridal shower. There were blueberry, lemon, rosewater, and vanilla macarons. The lemon ones were my absolute favorite. April absolutely loved the macarons and the cake plates, and was so excited to use them at her reception the next day. She even decided to use some of the macarons to be placed around her wedding cake. Place the ground almonds and confectioners' sugar in a food processor and process for 15 seconds. Sift the mixture into a bowl. Line 2 baking sheets with parchment paper. Place the egg whites in a large bowl and whip until holding soft peaks. Gradually beat in the superfine sugar to make a firm, glossy meringue. Beat in the vanilla extract. Using a spatula, fold the almond mixture into the meringue one-third at a time. When all the dry ingredients are thoroughly incorporated, continue to cut and fold the mixture until it forms a shiny batter with a thick, ribbonlike consistency. Pour the batter into a pastry bag fitted with a 1/2 inch plain tip. Pipe 32 small circles onto the prepared baking sheets. Tap the baking sheets firmly onto a work surface to remove air bubbles. Let stand at room temperature for 30 minutes. Preaheat oven to 325. Bake in preheated oven for 10-15 minutes. Cool for 10 minutes. Carefully peel the macarons off the parchment paper and let cool completely. To make the filling, beat the butter and vanilla extract in a bowl until pale and fluffy. Gradually beat in the confectioners' sugar until smooth, creamy, and holding stiff peaks. Use to sandwich pairs of macarons together. For the lemon macarons- add finely grated rind of 1/2 lemon to meringue mixture instead of vanilla extract, add a few drops of yellow food coloring, and sandwich the macarons with buttercream and lemon curd. For the rosewater macarons- add a few drops of pink food coloring to the meringue, and 2 teaspoons rosewater to the buttercream. We had such a great time at Occo. We all got manicures and pedicures. 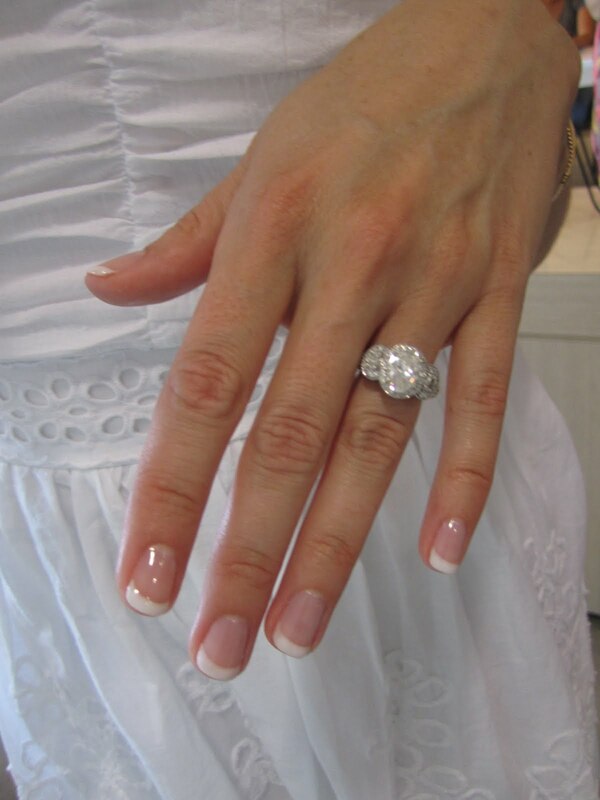 April even got the quintessential French manicure that every bride needs. What is it about a shiny diamond and French manicure that just screams Just Married? On our way out we spotted our Governor, Nikki Haley. She was so friendly and even took time out of her pedicure time to take a picture with us. What a perfect ending to a great bridal shower! Wow! Congratulations! I'm getting married this July, so I know how exciting it can be to get new brothers/sisters-in-law! I just found your blog via April's! Hers is one of my favorites, so I'm sure I'll love yours too! Those macaroons are incredible! I'm a new follower--please stop by my blog if you get a chance!